Marc Walkow has a long history in the home entertainment industry that extends back to the beginnings of the TLA Video stores. Since then, Marc has worked at Image, Criterion, and is currently best known as the face of Sushi Typhoon, Nikkatsu Studio’s popular specialty label that’s responsible for titles such as Cold Fish and Mutant Girls Squad. Marc seems to be constantly on-the-go between film festivals and movie productions, in an unlikely coincidence I actually happened to bump into him at a movie poster shop in Tokyo last fall. Marc took time out from his busy schedule to speak with Cinedelphia about the highs and lows of his career, his experiences with the Sushi Typhoon gang, and how Japanese genre fans differ from those of the rest of the world. CINEDELPHIA: To give readers an idea of your hectic life, can you briefly recap what you’ve been up to for the past few months? MARC WALKOW: The busiest thing was the New York Asian Film Festival, which we did back in July. It was our tenth edition, I’ve been with the fest for five years, so that took up a lot of time. The NYAFF is run by Subway Cinema so we had three partners doing basically everything for it, two week of films, 40 movies at Lincoln Center, Walter Reade Theater and Japan Society. We do the programming for that and organize all the guests and it’s fun while it’s going on, but it’s a hassle leading up to it. So that takes up four or five months of the year. The other thing that’s been keeping me busy is the Sushi Typhoon work that I do for [Japan’s] Nikkatsu [Studio]. I’m sort of the North American overseas head in terms of marketing and film festival booking. We recently decided to deal with a new American distributor to put out the rest of our films in the U.S., Alien vs. Ninja came out on Funimation, that was a title-by-title deal and we recently decided to go with another company, Wellgo USA, for the rest. They’re currently wrapping up the first title for November, which will be Yoshihiro Nishimura’s Helldriver. 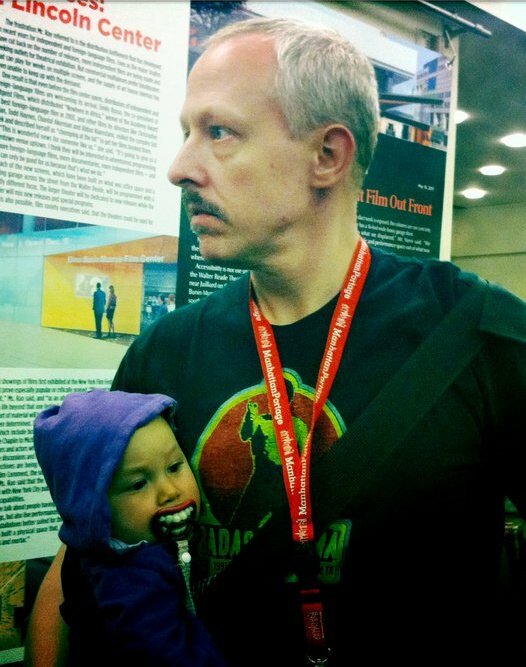 Plus I do programming at Fantastic Fest in Austin. C: You also seem to be an avid traveler. MW: Yeah, at certain times of the year there’s a lot of stuff. I recently went to Japan because, strangely enough, a lot of the Sushi Typhoon films hadn’t opened there yet. There had been screenings at the Yubari [International Fantastic] Film Festival in February up in Hokkaido, but they hadn’t had their regular openings. The only one that had come out in Japan was Mutant Girls Squad, which wasn’t released in Japan as a Sushi Typhoon film, it was actually produced by Toei Video, Nikkatsu had the foreign rights. So that came out last year at film festivals and came to DVD this year. The other films hadn’t opened in Japan yet and on the 23rd of July they had a big festival where they did a month long run of the four films, each one showed once a day and the schedule changed by week. So those were Yakuza Weapon, Helldriver, Deadball, and Alien vs. Ninja and those are playing in Kyoto now, then Osaka, Fukuoka and a bunch of other cities. C: Is it common for Japanese films to be received internationally before their domestic releases? MW: I think it’s totally unique. There really haven’t been a lot of incidents of that outside of one or two festival screenings. It’s pretty common where you have a film that will open in Venice or Cannes before the domestic opening, but even that isn’t always the case. C: Are Japanese audiences as rabid for this brand of Sushi Typhoon cinema as international audiences have been? MW: There’s a portion of the Japanese audience that gets excited about it. I think proportionally it might be the same just because the Japanese market is so much smaller, the population is so much smaller than the U.S. or Europe. In Japan I think it’s very solitary, people are fans on their own and they collect stuff and they talk about things online. C: These massive horror conventions don’t exist over there. MW: Yeah, there are no horror conventions in Japan really. There are fan conventions, but the Sushi Typhoon titles don’t really fit into that. When you go to these screenings in Tokyo, the theater is pretty much full, but Japanese audiences are traditionally quieter when they watch films, they don’t cheer and yell, a little bit maybe, but they’re much quieter than audiences in Europe and the U.S. So I’d say that there’s a good number of private fans in the domestic market in Japan, with population numbers its simply much smaller. You go to a Fantasia screening and there’s almost 1,000 people screaming, you go to Tokyo and there’s 150. C: To go back in time a bit, fifteen years ago you were Philly-based and an employee at TLA Video. MW: Yes, I’m from Pittsburgh and I went to college in Philadelphia, Swarthmore for a year. Then I went away for a year with my girlfriend at the time and then I came back and started law school at the University of Pennsylvania. I dropped out of law school after less than a year after I realized I just didn’t want to do it. I knew I liked movies so I got a job at the counter at the Bryn Mawr TLA store. Pretty quickly I started doing night manager work there and started writing for the catalogue and Rewind magazine. I got to proofread the first mass market published catalogue, it would have been in the mid 90s, David Bleiler was the editor. I eventually got to work downtown as General Manager in charge of all the stores. C: What led to your departure from TLA? MW: I got fired [laughter]. Yeah, I think once you reached about four or five years there it was just like, “You’re fired.” Everyone I knew there got fired. Anyone that’s worked at TLA knows that they’ve had a troubled history, there’ve been a lot of issues between some of the partners. They’ve changed over the years but they’re still breathing. Anyone who’s worked for TLA will know exactly what I mean. There’s always something going on there, but it really was a great place to work if you loved movies. From TLA I moved to northern Jersey where I briefly worked for a company called Digitainment. I’d applied for a job at Image Entertainment in Los Angeles and they passed my resume over to Digitainment, which was also a company called U.S. Laser. They were a wholesaler of laserdiscs, they also had a store up there. So I started working on the wholesale side and almost immediately after starting there, literally two or three weeks after my first day, I got the word that Image Entertainment had bought Digitainment and were shutting it down. Digitainment had been started by a guy named Dave Goodman who was one of the early pioneers of the laserdisc movement. So he sold the business and moved me and two other guys out to Los Angeles to work at Image, I worked in the marketing department there for three years. It was one of the biggest laserdisc companies at the time and I worked there right at the transition to DVD. I ended up supervising a lot of the genre labels…we created the Euroshock Collection, which was a lot of European horror stuff, the U.S. cult exploitation films, we did the American Cinematheque collection of some Japanese films, which was my first exposure to Female Convict Scorpion and some of the Koji Wakamatsu films. C: Were these genre films your specialty or main area of interest at this point? MW: I’d always been a fan of horror movies and Japanese monster movies and sci-fi, but the other kind of wider Japanese cinema I learned when I was out there through movie trading with friends and attending the American Cinematheque on Hollywood Boulevard back when they were doing really great programming. There were a couple of guys, Dennis Bartok and Chris D., who were really knowledgeable and they’d bring guests in from Japan. The Japanese Outlaw Masters series started when I was out there so I made friends with them and got to collaborate with them. Chris taught me a lot about Japanese cinema and my interest grew from there. I wound up hiring Chris later on to do liner notes and commentaries when I was doing special features for DVD and Blu-rays. C: And you headed back to the east coast from there? MW: Yeah, I moved to New York and started working at Criterion Collection. I’d been communicating with Criterion a bunch at Image who were one of the distributors for Criterion along with Home Vision. So I’d been dealing with Criterion on a more or less weekly basis. I asked the [Criterion] president if I could have a job and they happened to need someone to deal with Image so I kind of switched places and became a production manager there. I’d actually worked with Criterion when I was at Digitainment, when people bought from Criterion the order was actually going to Digitainment. So Criterion started doing DVD and they had a really bad reputation, every title had missed its street date, every title that they announced would be late, so one of their main objectives in hiring me was to smooth that out, to keep the retail accounts happy and be more consistent on the releases. Then I wound up moving to be an internal production manager, doing distribution-type stuff. I wound recommending different films to them and I worked with them on some licensing things and content. I worked on the Videodrome set pretty heavily with the main producer, the Richard Gordon box set [Monsters and Madmen]. One of the things that led up to this is that I sort of got put in charge of the Merchant Ivory Collection. Criterion ended up licensing 25 Merchant Ivory features and short films and didn’t have an idea on how to get these out to the marketplace in an effective way. We put together a release schedule and an easy way to do the covers, liner notes, masters and so on. We had special editions of Howard’s End and Maurice, so those are all my things that led to other things like Videodrome, the concept of the Rebel Samurai box set, these films were just sitting in the vaults and no one knew what to do with them separately. I ended up getting them to license Jigoku, which I produced around the time I left, and finally Hausu. They were re-upping the licenses of some films with Toho and at the same time they ended up picking up Kuroneko, the Shindo film, and I said you should get Hausu, this wild and crazy Japanese film that I’d only seen unsubtitled, I’d bought the Japanese DVD on a whim because someone recommended it to me. It’s a really visual film, you can watch it without the subtitles. I wound up producing all of the supplements for that release too. C: What led to your departure from Criterion? MW: I got fired from there too [laughter]. I end up getting fired from everywhere. Yeah, I’d been there for five years, they hired me to do production management type stuff, and I ended up being put in charge of what was to be the Eclipse label. Criterion had always had trouble not creating giant special editions of everything…Criterion has always said we’re going to give the movie the treatment it deserves regardless of how much we think it’s going to sell. There’s always has been a discrimination against genre cinema at Criterion except for things that can be looked at tongue-in-cheek, like The Blob, or stuff that has really been canonized or stuff that’s associated with a producer or a sales company that Criterion has a really good relationship with. So even though you have Kurosawa films getting that treatment, when it came time to release something like Okamoto’s Kill! it was really like twisting peoples’ arms to get it out. They have hundreds and hundreds of films in their vault and they’re continuously acquiring new ones. So it was like, “How do we get stuff out of the vault quickly?” and that turned into the Eclipse label, the strange basically no supplement box sets where they can do stuff under a theme, a director, a star, a genre. So I was put in charge of that after the Merchant Ivory collection was finished and then the company lost it’s nerve a bit, it’s always been a company that took a long time to make decisions, which isn’t necessarily a bad thing. They wound up postponing the series so there wasn’t much left for me to do except be frustrated. There was lots of stuff I wanted to do, projects and this and that, and in the meantime they hired another production manager. So it was like, “You don’t really belong” and I said “I don’t really belong here” and it was fine. I’ve done stuff with them since like the Richard Gordon set, Jigoku, Hausu, the Nikkatsu series that ended up becoming the Nikkatsu Noir set, the new Koreyoshi Kurahara films that just came out. So I have stuff going on that I’m in constant communication with them about. C: You had a hand in that touring Nikkatsu action series, right? MW: That was more or less me, yeah, at least the U.S. portion of it was. Mark Schilling, a Tokyo-based film critic who writes for the Japan Times and is a film festival programmer for the Far East Film Festival, had done a series of 17 or 18 Nikkatsu action films from the ‘50s and ‘60s in [Udine, Italy’s] Far East Film Festival in 2005, I think. I saw a lot of those films there. I’d only known about the Seijun Suzuki films, Branded to Kill, Tokyo Drifter, I liked those. Suzuki first came to light for Western audiences back in the early ‘90s when BtK and TD came out through Criterion on laserdisc and tape. It was around the time Suzuki did his Taisho Trilogy so people rediscovered his Nikkatsu films around then. So the legend that became the truth was that Suzuki was this one artistic guy at this studio churning out all these crappy B-movies and he was the one guy who said that he wanted to do something artistic and he got fired for it. That was basically the story that was being told. And certainly when Criterion just had BtK and TD, the packaging said that these are the crème de la crème of the stuff that was produced at this factory studio, which I guess is true, but when you look more closely, you start to go “Wait a minute, there’s a lot of really good movies here, not just Suzuki, and there’s lots of other guys that didn’t get fired, directors who just did what the studio wanted, churning out films.” Like Toshio Masuda who made Red Handkerchief and Velvet Hustler, many other films, he was kind of their top director. So it’s like saying Warner Bros. crime films or noir films of the 40s are crap. I mean, they’re B-Movies, but in many cases these are the movies that you remember. You don’t remember who won the Best Picture Oscar for a certain year, you’re remembering the ones that do something a little more interesting. I think that’s true with the Nikkatsu films of the 60s and 70s, a lot of the top films aren’t memorable, they’re star vehicles, but the B pictures…these are a combination of Roger Corman meets noir. So I saw all of these films in Udine and a year or two later I was with Mark at another film fest in Frankfurt, Nippon Connection, and we’d always been talking about doing these films in America so I said “Let me see what I can do.” We picked eight or 12 films and put together a package and showed them at 20, 25 cinematheques around the U.S. and Canada. And that more or less led to Criterion picking some up for the box set. Now this year, starting October 1 at the New York Film Festival they’re doing a 100 year anniversary retrospective of Nikkatsu, they turn 100 next year, and this had been in the planning stages for a while, but I think contents of this were a little bit effected by the series I did where there’s a lot more Nikkatsu action in there. It’s gratifying to see those longer time ripples from what I’ve been doing. C: At what point did you start learning to speak Japanese? MW: I was still at Criterion and I started going to the Japan Society after work, it was around 2005, so I just took some classes at the Japan Society and started going to Japan, learning by necessity. My Japanese is far from fluent and I make a lot of mistakes. C: It was only five years later that you were in front of crowds doing translations for filmmakers. MW: Well, one of the reasons I can do that is because I tend to know all the stories already. The Sushi Typhoon filmmakers tell a lot of the same stories so it’s easy to do that. For most filmmakers I can handle it. At the Yubari festival I had to do this onstage talk with the director of Hausu with no translator and we kind of muddled through it. C: How did the Sushi Typhoon label come about originally? MW: Sushi Typhoon was an idea from Yoshinori Chiba producer of Machine Girl and Tokyo Gore Police and he goes back to movies like Zeiram and Miike’s Fudoh. He wound up at Nikkatsu and they partnered up with Media Blasters to produce Machine Girl, he knew the filmmakers and came up with the concepts with them and Media Blasters. So Nikkatsu created the Sushi Typhoon label for these filmmakers who had been working with Media Blasters or who had had their films acquired by Media Blasters. As we were saying before, foreign audiences are a bigger portion of this audience for low budget Japanese genre films. I’d asked them to become involved very early on, I had the connection through the Nikkatsu action series, and then through Subway Cinema and the NYAFF we did the World Premiere of Takashi Miike’s Yatterman in February of ’09 and they used the huge reaction it got here and at other places like Comic Con to support the release in Japan. And it turned out to be Miike’s biggest hit, at least until Crows Zero 2 came along. C: I actually saw Yatterman at a theater in Tokyo and picked up the souvenir book, which has photos from the NYAFF premiere. MW: Yeah, so we contributed to that. So at some point I told them that they needed someone overseas to work on this because they needed someone to create the English language material for this. When I pitched myself, the first lineup of films had already been decided, only one was actually in production, I think Mutant Girls Squad came after that. 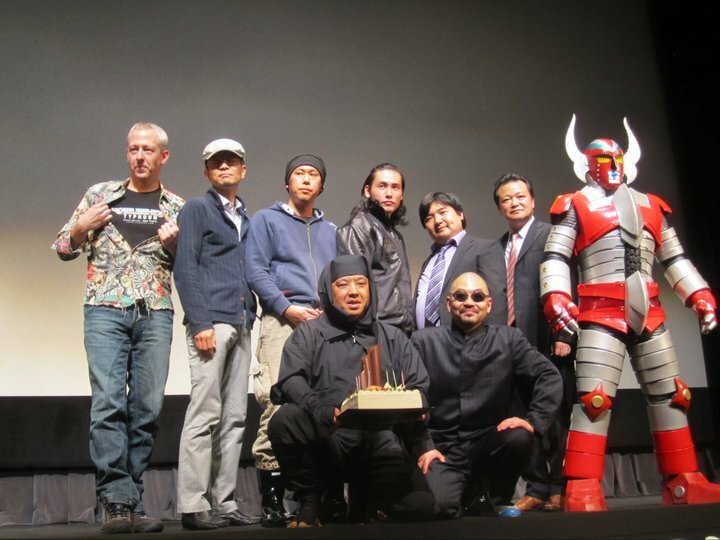 Before that, I’d become friendly with [Yoshihiro] Nishimura and [Noboru] Iguchi through my film ties, we were the second people in the world to show Tokyo Gore Police, we saw a rough cut of it at Media Blasters, no CG, no music, very unfinished, but I loved it and wanted to program it immediately. If it weren’t for this tiny festival in Hamburg we would have been the world premiere, but we’ve premiered all of his films since then more or less. C: Do the Sushi Typhoon films share commonalities? MW: Well they’re all more or less at the same budget level, under a million U.S., and they’re all made under the close supervision of Chiba and Nikkatsu. The idea is to give these filmmakers free reign, to not put any obstacles in their way. On the backside of Sushi Typhoon is Chiba’s idea to produce things on their own, three persons max. Most films in Japan, big budget films in Japan, are made by the seisaku iinkai, which is the Production Committee System and that is why you see 12 companies listed in the opening credits of Japanese films. I think the biggest was Space Battleship Yamato, which had something like 30 companies behind it. The budgets are too big, the stars cost too much, the risk is so big that you’ve got a lot riding on it and the movie studios don’t have the money to make these kinds of films anymore. So they team with television studios, who are actually becoming the movie studios now, talent agencies, all kinds of stuff. They all contribute something so they have guaranteed television coverage, guaranteed variety show time on the co-producers’ networks. The downside of it is that when there’s any decision that needs to be made, everyone needs to agree and there’s a lot of restrictions imposed because of that. It’s a very sluggish process because of that. So as with any creativity by committee you get a lot of watered down results. It’s very unresponsive to creativity. On the other hand, what Chiba wanted to do was have one or two people involved, that’s it. The mantra for Sushi Typhoon is “do whatever you want”. As long as it fits within the budget and with very minor restrictions of casting and so on, anything goes, let’s push the envelope as far as we can. C: You have a personal relationship with a lot of the filmmakers and talent involved in the Sushi Typhoon titles. Are they as crazy as they seem during their film festival introductions and appearances? MW: They’re really fun people, they really enjoy making these kinds of film. With the directors, what you see is definitely what you get. On the other hand, they’re extremely serious about the work they do, they are very hard workers, very dedicated to what they want to create and there’s really no messing around. These things shoot for two weeks, literally 20 hours a day. Budgets are really low, there’s almost no time for breaks and they’re basically killing themselves trying to get these movies done. They work hard and they play hard. C: I remember during the intro to Vampire Girl vs. Frankenstein Girl at the NYAFF, the director related a story about how he cast a real-life cutter in the role of the self-mutilator in the film and how, at the wrap party, this same actress gave him a box of chocolates filled with her own blood. MW: [Laughter] I know who he was talking about. It’s a bizarre collection of characters. I will say that they’re definitely not your average Japanese people. These aren’t folks that would get regular jobs; they wouldn’t work for corporations. There’s a strange family atmosphere. C: Do these over-the-top horror films appeal to you personally? MW: Totally. I’ve always been a fan of this kind of stuff. C: What are some of the horror films that have come to define your personal tastes? Thanks, Marc! You would usually see Marc at the 24 Hour Horror-Thon, but he is currently preparing for a month long visit to Japan where he’ll be attending the Tokyo Film Festival and overseeing the production of three short films, among other things.